Over the years, scientists have come to realize that accurately predicting nitrogen (N) problems in water resources depends on knowledge of the interaction among many factors. It is a complicated process that we have not yet mastered, but we do know that some factors consistently exert significant control over the processes that affect N mobility, availability, and accessibility. Determining the value of these factors and combining those values into a single value assigned to a specific geographic area is the basis for assessment. The mobility of N with respect to groundwater is related to chemical properties that affect the ease of transport with water and adsorption to soil particles. Nitrate (NO3) is the most mobile form of N because of its high solubility and negative charge. Natural factors (Table 1) that favor mineralization of N will increase the potential for groundwater contamination because NO3 results from mineralization. Table 1. Criteria for high potential to affect N translocation to groundwater as related to natural factors. Soil aeration affects mineralization, immobilization, and denitrification. Well-aerated soils provide a favorable environment to convert N to NO3 with only minimal loss through denitrification. Soils with internal drainage characteristics that allow good aeration have potential to serve as sources for the NO3 form of N even though immobilization and plant uptake will counterbalance much of the NO3 released by mineralization. Well, somewhat excessively, and excessively drained soils have gas exchange characteristics that promote aerated conditions required for nitrification. Soil texture influences groundwater contamination from N in several ways. The ease of drainage through coarse-textured soils often results in conditions that favor the NO3 form of N. The fixation of ammonia (NH3) and ammonium (NH4) may be a significant factor in preventing NO3 leaching under certain soil and climatic conditions. Fixation and adsorption of NH3 and NH4 are primarily controlled by the amount of clay and organic matter in the soil. Coarse-textured soils characteristically have only low amounts of both, limiting their ability to retain either NH3 or NH4. NH4 converted to NO3 would be available to be quickly leached from the soil profile. These soils offer little resistance to vertical movement of N. Aquifers underlying coarse-textured soils are more accessible to surface contaminants, because their infiltration and permeability allow quicker and deeper penetration of water compared to finer textured soils. Soils that are classified in the USDA family particle size groups of sandy, sandy-skeletal, or fragmental should be considered to be relatively vulnerable to NO3 leaching. Depth to the aquifer from the soil surface influences the accessibility of contaminants to groundwater. An aquifer within 50 feet of the ground surface should be considered vulnerable to NO3 contamination. Some studies indicate extremely shallow groundwater depths may be linked to high rates of denitrification that reduce the potential for contamination from NO3. However, the effect of denitrification on availability of NO3 is accounted for by assessing for the aeration factor. Groundwater recharge is controlled by the amount of water that infiltrates the soil surface and percolates beyond the rooting zone of plants. The presence or lack of certain features in the soil provide a general indication of water movement. In the northern plains, the depth to accumulations of calcium carbonate can be used as an indicator of water movement. The accumulation of calcium carbonate in soils is influenced by climate and landscape position. Deeper depths to calcium carbonate indicate greater leaching due to downward movement of water. Soil survey information can be used to relate the depth of calcium carbonate to groundwater recharge areas. When calcium carbonate is not present in the upper 20 to 30 inches of the soil profile, this is an indication of a groundwater recharge area. Anthropogenic or human factors have the greatest influence on N availability. 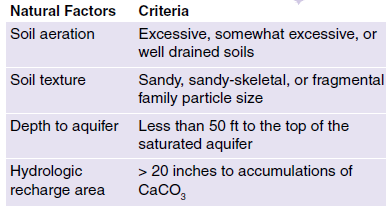 Aquifer vulnerability is defined by the combination of natural factors, whereas aquifer sensitivity is defined by the combination of natural and human factors (Table 2). Table 2. Criteria for N translocation to groundwater as related to anthropogenic (human) factors. Concentrated human activity includes a wide variety of N sources that create contamination problems because of large quantities of N in relatively small areas. Examples of this type of N source are facilities related to: animal production; production, storage and use of synthetic fertilizers; and human waste disposal. There is little doubt that as the distance between water wells and these sources of N decreases, higher than normal concentrations of NO3 are found more frequently in well water. However, NO3 concentrations can rarely be predicted with just the distance to a concentrated N source. In general, boundaries such as city limits or farmstead limits help to identify areas of concentrated human activity. Cultivated land includes areas of cropped fields that are generally tilled to some degree, have an unnatural composition of vegetation that lacks diversity, and often have fertilizer routinely added. Under these conditions mineralization is usually favored over immobilization, and plant uptake of NO3 is not as efficient compared to natural vegetation. The result is greater availability of NO3. In addition, non-crop periods may lead to excessive soil water that drains beyond the reach of the following crop roots. Many factors will ultimately determine whether groundwater under cultivated soils will become contaminated with NO3. However, compared to soils under natural vegetation, cultivated soils have greater potential to contribute to N contamination of groundwater. Crops have different patterns of uptake that fulfill their requirements for nutrients and water. Nutrient and water uptake by the crop during the growing season affect availability of NO3 in the soil. Crops with lower N use efficiency (NUE) have greater potential for N losses. Corn, potatoes, and vegetable crops have nutrient requirements and growth patterns that cause lower NUE compared to other crops such as small grains. Summer fallow (black or chemical fallow) contributes to increased availability and mobility of NO3 in soil. NO3 from mineralization accumulates during the uncropped year because there is no plant uptake. In addition, water accumulated in excess of field capacity during the fallow period is likely to drain beyond the rooting zone of the following crop. Studies from Montana show a strong link between summer fallow and NO3 concentrations in water wells. Fields that include idle periods between crop rotations for the purpose of storing N and water in soils are considered to have increased availability of NO3 for groundwater contamination. Irrigation often involves growing crops with high nutrient requirements and/or shallow rooting depths, thus increasing the potential for NO3 leaching. Increased N application rates generally result in greater quantities of residual NO3 because of low N use efficiency (NUE). The impossible task of getting rainfall, irrigation applications, and crop water use to exactly coincide results in periods where field capacity of the soil is exceeded and some drainage occurs beyond the crop-rooting zone. In fact, under many circumstances some drainage is beneficial because it leaches salts from the crop-rooting zone. Unfortunately, leaching increases the potential for N contamination of groundwater, particularly where high levels of N fertilizer have been applied. Water management is a critical factor in reducing potential NO3 leaching. Given the general status of N and water under an irrigated environment, the potential for NO3 leaching to occur must be considered greater during the growing season compared to the general conditions under dryland farming. The extent to which the potential is increased will vary with different crop rotations, soils, geology and climate. The first step in determining aquifer sensitivity is to determine the location and boundaries of the aquifer. The best source for information on aquifers in North Dakota is the County Groundwater Studies Reports. In addition, the North Dakota Water Commission maintains a water well database that is open to public access. The depth to the top of the saturated zone in aquifers is derived from this information. Unfortunately, many small aquifers are not identified in the County Groundwater Studies Reports and information regarding extent and depth must be determined using other sources of data such as well driller logs. As mentioned before, aquifer sensitivity considers both natural and human factors. The factors outlined may be combined in a variety of ways. Local evidence may justify assigning greater weight to some factors or less to others. However, without strong evidence to assign variable weights, each factor should be considered equally. The simplest method of determining aquifer sensitivity would be an additive system. Each factor would carry equal weight and would receive a value based on a standard scale. Low potential to contribute to aquifer contamination would have low values and vice versa. The factor values would then be added together and those areas with the lowest score would have low sensitivity and vice versa. This type of system can be easily adapted to GIS and used to represent zones of varying sensitivity throughout any geographic region of choice. Ultimately, knowledge of aquifer sensitivity is intended to assist with management decisions that reduce the potential for N contamination. Choosing management methods that will be effective depends on the factors that are most likely to contribute to N leaching. GIS provides the opportunity to quickly identify which factors contribute to high sensitivity and to also locate their extent. Management decisions based on the extent and degree of risk of contamination are most likely to achieve the desired results of resource protection. Nutrients in surface water have been found since observations began years ago. By relating watershed characteristics to nutrient observations from water resources, a variety of methods have been developed to predict nutrient inputs to streams and lakes. As with groundwater, factors that affect N mobility, availability, and accessibility must be evaluated to predict where and when N contamination may occur. Depending on the level of accuracy required, estimating impacts of N on streams and lakes may be accomplished using existing data or may require intensive monitoring and sophisticated computer processing. When predictive methods attempt to estimate nutrient contamination over extensive areas, the results become more qualitative, because they are more dependent on survey data as opposed to site specific monitoring and analyses. For the purposes of determining appropriate management systems and priorities for water resource protection, use of survey data is the only reasonable alternative. Site specific studies can be used to enhance and support conclusions reached through the use of survey information. Several forms of N are likely to pose surface water contamination problems. The most soluble and mobile forms are nitrite and NO3. Generally NO3 is present in much greater quantities than nitrite, because nitrite is quickly oxidized to NO3 when oxygen is present. NH4, is also present in the soil due to mineralization of organic matter, but under most conditions is quickly converted to NO3. A portion of the NH4 is adsorbed to either clay or organic matter and may be mobilized and transported with eroded sediment. Most N in the soil exists as a component of organic chemicals such as proteins, amino acids, and nucleic acids. Removal of N from the soil and introduction to water resources involves transport in both water and sediment phases. Factors that affect removal and transport of N within both of these phases must be assessed. However, factors that affect N conversion from one form to another subsequent to removal are equally important with respect to water quality impacts. Under most circumstances, the bulk of N removed, transported, and deposited in water resources is associated with sediment. Of equal importance in terms of environmental management is the effect of a comparatively small quantity of NO3-N delivered via the water phase. Because of its biological activity, NO3 has a much greater influence on the condition of water resources than the relatively small losses from soils would indicate. Application of management practices for soil conservation is based on knowledge of soil characteristics and their extent. Because of the integral role that soils play in determining runoff and nutrient transport, management practices for water protection should also be closely tied to soils information as provided in a standard county soil survey prepared by the Natural Resources Conservation Service (NRCS). The computer compatible digital version of soil survey is known as the Soil Survey Geographic (SSURGO) database and is essential for assessment. Assessment factors (Table 3) have been selected based on their observed effects on N transport to surface water resources. Accessibility of data to measure the value of each factor was also a consideration. Information required to determine the potential for N transport as related to each factor can be found in the soil descriptions and/or tables contained in the NRCS county soil survey report. Table 3. Criteria for high potential to affect N transport to surface water as related to natural factors. Surface water proximity to sources of N has been recognized as one of the most important factors that affects contamination. In a watershed study on the Coastal Plain of South Carolina, impacts to water quality were mostly related to management within 500 feet of the stream. Runoff and sediment losses from watersheds are most closely associated with ephemeral streams or gullies; therefore, the condition of areas immediately adjacent to this surface network of drains has an impact on water quality farther downstream. Contributions of runoff from various portions of the drainage network will be variable and depend on the intensity of each hydrologic event. As intensity and duration of precipitation increase, the area of the drainage network that contributes to runoff also expands. All potential drainageways need to be considered with respect to sources of contamination from adjacent hillslopes. In the northern prairies road ditches and other manmade drainageways allow runoff to reach streams from areas that would not have affected stream flow in the past. The adjacent land that slopes directly into the network of ephemeral drains has the greatest potential to serve as a source of N contamination. Soil aeration was discussed previously with respect to groundwater and has a similar effect on surface water. The presence of NO3 is favored in soils that are well aerated. When excess NO3 exists in the soil, there is increased potential for movement to water resources. Soils with good internal drainage have greater potential to serve as the source of NO3 contamination of surface water compared to wetter soils that are not as well aerated. Mobilization in solution for surface water transport of NO3 depends on soil characteristics that affect runoff. The hydrologic grouping (A, B, C, and D) for each soil type is based on infiltration rates, group A having the highest rate and group D the lowest. During rainfall events, soils with lower infiltration rates have the greatest potential to exceed the infiltration capacity, resulting in free water accumulation on the soil surface. NO3 is mobilized in this situation and free to move with surface water runoff, which will depend on other factors such as slope and surface cover. Soils in hydrologic group D would have the greatest potential for mobilization of NO3 in surface water. Mobilization with sediment for surface water transport of N depends on soil characteristics that affect runoff and detachment of soil particles. The susceptibility of soil particles to detachment and movement by surface water runoff is reflected in the soil K factor (as used in the Universal Soil Loss Equation) that may range from 0.02 to 0.69. High K factors have greater potential for erosion losses to water. When the K factor is combined with the soil hydrologic group, as discussed previously, the potential for mobilization of sediment and adsorbed nutrients can be estimated. Soil with a K factor near 0.69 that belongs to hydrologic group D would have the greatest potential for mobilization of sediment for movement with runoff water. As indicated previously, actual surface water runoff also depends on other factors such as slope and surface cover. Land slope (vertical/horizontal distance) has a positive correlation with the amount of runoff and eroded sediment. In other words, there is generally greater runoff and sediment from steeper areas. Slope alone, however, does not determine runoff or sediment losses. Flooding frequency determines how often materials are removed and deposited on floodplains. The potential for N translocation from these areas increases with the frequency of flooding events. Frequent flooding as defined by the NRCS would have the greatest potential for N losses, while none to rare flooding would have the least. Human activities can be categorized into a group of factors that also affect the potential for N to contaminate surface water resources. The effect of land drainage via road ditches has already been discussed with respect to the natural drainage network and is most logically accounted for with the natural drains under the proximity factor. Anthropogenic factors (Table 4) are considered important because of their effects on N availability. Anthropogenic factors are considered together with the natural factors that define vulnerability to estimate the overall sensitivity of a given surface water resource to N contamination. As discussed previously, landuse databases may be used to help assign values to anthropogenic factors. LandSat images processed to identify agricultural fields are very useful. In addition, GIS boundary data provided by the North Dakota Department of Transportation help place boundaries on areas of human activity. Table 4. Criteria for N translocation to surface water as related to anthropogenic (human) factors. Concentrated human activity contributes to greater accessibility and availability of N to surface water runoff. High levels of N in streams have been associated with septic system discharge in some areas, while high amounts of NH3 have been observed downstream from many urban areas. Surface runoff and volatilization of NH3 from large feedlots have been demonstrated to contribute to high levels of N in nearby streams. Areas within the limits of cities, farmsteads, and other sites of concentrated human activity have a high potential to contribute N to surface water resources. Cultivated land has been shown to contribute greater quantities of N to local streams compared to less intensive landuse with continuous vegetation. Cultivation increases mineralization and exposes the soil surface to the erosive power of water and wind. Also mentioned previously, agricultural crops do not use N as efficiently as native plant communities. Tilled summer fallow is the most vulnerable condition to the erosive forces of water and wind for any soil. The resulting loss and deposition of sediment from summer fallow fields contributes to nutrient contamination of surface water. Compared to fields where summer fallow is not used or to fields with chemical fallow, the potential for tilled summer fallow to contribute to contamination of surface water is high. 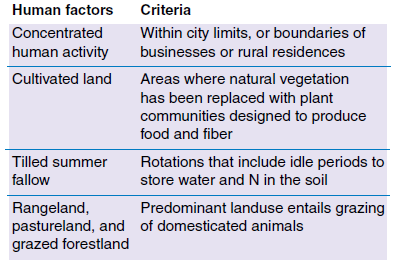 Rangeland, pastureland, and grazed forestland are used more intensively than ungrazed areas. It is recognized that grazing causes soil disturbance within permanently vegetated areas, and the disturbance increases with intensity of grazing. Consequently, overgrazing of pastureland and rangeland contributes to soil degradation and erosion. Whether soil erosion occurs from cropland or permanently vegetated areas, the water quality impacts remain the same as discussed in previous sections. Rangeland, pastureland, and grazed forestland have greater potential to serve as a source of N contamination of surface water compared to ungrazed areas. The first step in determining surface water sensitivity is to determine the location of surface water bodies and their drainage network. There are several sources that can be used to locate surface water resources. County soil survey reports contain maps with the most detailed depiction of surface drainageways and ditches. The location of perennial streams and rivers can be obtained from the GIS boundary database maintained by the North Dakota Department of Transportation. The location of lake boundaries may also be obtained from this database. The location of wetlands can be found on county soil survey maps and also in the National Wetlands Inventory maintained by the U.S. Fish and Wildlife Service. Once the location and extent of surface water resources and their drainage network has been determined, the natural and human factors can be evaluated. Surface water proximity can be determined by measuring the desired distance from the drains within the network. Using GIS, a buffer of the appropriate distance can be easily created. Evaluation of soil aeration, N mobilization in solution, N mobilization with sediment, land slope, and flooding frequency can be done using GIS and the NRCS SSURGO database. Landuse patterns that identify cultivated land, tilled summer fallow, and rangeland, pastureland, and grazed forestland can be extracted from LandSat images using GIS. Areas of concentrated human activity such as city limits, recreational facilities, and farmsteads may be extracted from the digital boundary database maintained by the North Dakota Department of Transportation. Locations of concentrated animal feeding operations (CAFO) may be obtained from the North Dakota Department of Health. Similar to the determination of aquifer sensitivity to N contamination, surface water sensitivity also considers both the natural and human factors. Refer to the discussion about aquifer sensitivity regarding the combination of these factors. It should be noted that the interpretations of surface water sensitivity and aquifer sensitivity are somewhat different. Surface water sensitivity is an estimate of the potential within a given area to serve as a source of N contamination with respect to the drainage network. It is not an estimate of the sensitivity of specific water bodies. On the other hand, aquifer sensitivity is related specifically to areas within the discrete boundaries of an identified aquifer. The aquifer sensitivity assessment can be used to compare different aquifers. The surface water sensitivity assessment can’t be used to compare streams or lakes but can be used to compare the watersheds that contribute to them. Assessment of surface water sensitivity is just as adaptable to GIS as aquifer sensitivity; refer to the aquifer sensitivity discussion for more detail.